Below you fill find all funeral homes and cemeteries in or near Somerset. Suburbs of Somerset: East Millstone, E Millstone, Franklin Twp, Middlebush, Zarepath. Somerset is also known as: Somerset County / Somerset CDP. Zip codes in the city: 08873, 08875. Some of the notable people born here have been: Gabriel Caste (actor), and Brian Dawson (actor). 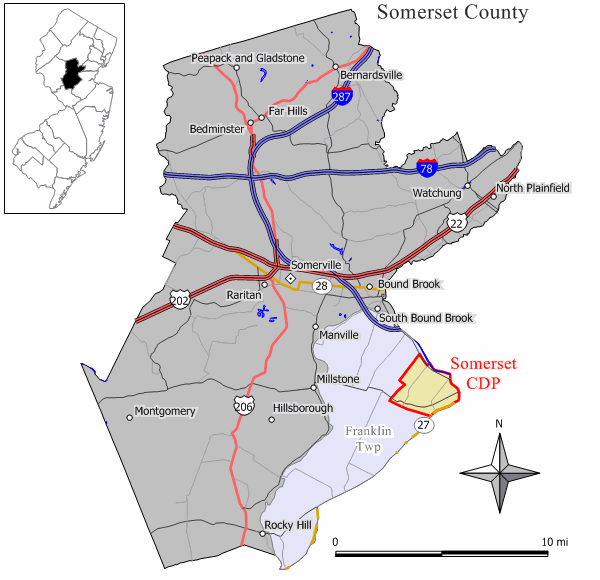 Not to be confused with Somerset in Ewing Township, Mercer County.Somerset is an unincorporated community and census designated place (CDP) located within Franklin Township, in Somerset County, New Jersey, United States. As of the 2010 United States Census, the CDP's population was 22,083.Somerset housed one of the first Marconi Wireless Stations in the United States. It was noted on September 9th, 2018 that Abram Robert Sr Smith died in St Petersburg, Florida. Smith was 60 years old and was born in Somerset, NJ. Send flowers to express your sorrow and honor Abram Robert Sr's life. It was revealed on April 24th, 2018 that James "Jim" French passed on in Oklahoma City, Oklahoma. French was 73 years old and was born in Somerset, NJ. Send flowers to express your sympathy and honor James "Jim"'s life. It was noted on November 17th, 2017 that Marilyn miss Molter passed on in Tampa, Florida. Molter was 53 years old and was born in Somerset, NJ. Send flowers to express your sorrow and honor Marilyn miss's life. It was revealed on June 18th, 2017 that Janet Waddington (Bay) died in Sun City Center, Florida. Send flowers to express your sorrow and honor Janet's life. It was written by The Daily Journal on March 9th, 2017 that Shirley A Hitchner (Mangini) perished in Somerset, New Jersey. Ms. Hitchner was 82 years old and was born in Uniontown, PA. Send flowers to express your sorrow and honor Shirley A's life. It was written on January 27th, 2017 that Paul Lachance perished in Somerset, New Jersey. Lachance was 83 years old. Send flowers to share your condolences and honor Paul's life. It was revealed by Sarasota Herald-Tribune on January 21st, 2015 that Gary J Viddish passed away in Sarasota, Florida. Viddish was 64 years old and was born in Somerset, NJ. Send flowers to express your sympathy and honor Gary J's life. It was revealed on June 28th, 2013 that Jayne Groen died in Somerset, New Jersey. Groen was 57 years old and was born in Ridgewood, NY. Send flowers to share your condolences and honor Jayne's life. It was disclosed by Morganton Herald on February 17th, 2012 that Anthony George Szymanski passed away in Valdese, North Carolina. Szymanski was 69 years old and was born in Somerset, NJ. Send flowers to express your sorrow and honor Anthony George's life. It was revealed on January 27th, 2012 that Millie G Woods died in Somerset, New Jersey. Woods was 82 years old. Send flowers to express your sympathy and honor Millie G's life. Somerset is a census-designated place and unincorporated area (New Jersey) area located at the eastermost section within Franklin Township, Somerset County, New Jersey Township, in Somerset County, New Jersey County, New Jersey. As of the United States 2000 Census, the CDP population was 23,040. Somerset housed one of the first Marconi Wireless Stations in the United States . . .
Harley is survived by Eleanor, his wife of 56 years, of Somerset, NJ; daughter Linda and husband Victor Lopez ... Calling hours will be held at The Mather-Hodge Funeral Home, 40 Vandeventer Ave, in Princeton on Wednesday, Nov 3 from 7:00 to 9:00 pm. Listing all funeral homes in Somerset, Kentucky so you can easily send flowers to any location (same day delivery) or find any funeral service. A list of Funeral services in Somerville, NJ: Includes phone numbers and web addresses for businesses in or around Somerville, NJ. We work with local florists and flower shops to offer same day delivery. You will find budget sympathy flowers in Somerset here. Our funeral flowers are cheap in price but not in value.